I’ve been madly in love with tennis since my mom got me to watch my first game 22 years ago. It was Arantxa Sanchez vs. Steffi Graf, I supported miss Sanchez that day—always a fan of the underdog—and unsurprisingly she lost though she made a great second set. Since then, I’ve never missed a single Grand Slam, no matter what, especially after watching the rise of a Swiss boy named Roger Federer who grew to be my ultimate best. Today, I’ve made you a list of six health benefits playing tennis can give you, check it out, and hopefully, you become as mad about watching and playing, tennis as I am. The best thing about playing a sport that you enjoy is that you burn tons of calories without even feeling bored. Time literally flies by and by the time you feel tired you’ve already burned more calories than you may burn on an average day in the gym. One of the sports that burn lots of calories is tennis. According to a Harvard study, the average 150-pound person burns between 288 and 500 calories for every hour of tennis depending on whether it’s a singles or doubles game. The number rises drastically in competitive singles games where a game can last between 2.5 to 4 hours which means burning more than 800 calories per game. Now you can go sleeveless and say goodbye to saggy arms (also known as bat wings). Old people and those who rely on just diet to lose weight without playing sports usually have excess arm skin which is why many don’t wear sleeveless shirts. This problem of flabby, loose skin can be gone with tennis which, despite incorporating many body parts, relies mostly on the arm strength and will force you —if you decide to make it a hobby— to work on your arms on the court and in the gym. You’ll automatically add moves like triceps dips and overhead curls to your gym routine, and the side benefit will be taming those bat wings and aligning them to the arm muscles you gain along the way. 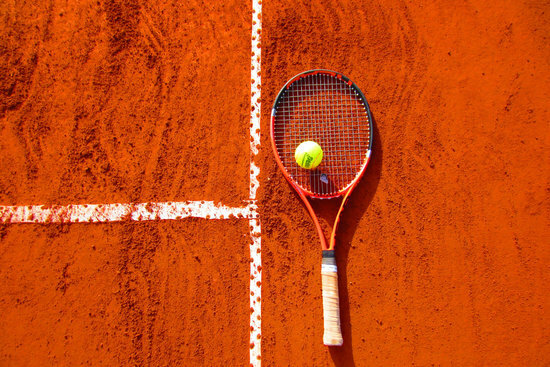 Tennis—sports, in general—has many mental benefits, one of which is reducing anxiety. According to a 2014 study by the University of Bern in Switzerland, playing sports has the same neurophysiological effects on the brain as antidepressants. The study found both the drugs and sports alleviate depression by reducing the effect the stress hormone, cortisol has on the brain. Exercise stimulates the production of endorphins, which makes you relaxed and puts you in a good mood. Elevated blood pressure or ‘’hypertension’’ is a condition that affects more than one-third of American adults. It damages the arteries, reduces the amount of blood reaching the brain, weakens the heart muscles and may cause strokes. One of the ways to ensure your blood pressure always remains stable is to practice sports like tennis. According to this report, more than 24 studies were conducted to investigate the health benefits of playing tennis and most of them—22 studies—agree: consistent tennis players have healthier bones, better lipid profiles, and fewer risks for developing cardiovascular disease. The older you get, the more muscle flexibility and strength will go south. Ask your parents if things like standing up or bending their knees have become more difficult as they got older, and the answer will be ‘yes’. The good news is the amount of rotation and footwork in tennis is insane which is why it will make you flexible. In a sport where you’re required to change positions and chase after every single ball frequently, tennis will increase your range of motion and make your body more flexible and agile. Also, and according to research, tennis improves bone health and helps recompense for any muscle loss, which will help your mobility as you grow older. Though team sports are famous for elevating team spirit and improving social anxiety, individual sports like tennis are great at boosting self-confidence and self-reliance. Tennis players are mostly on their own and have all the spotlights on them. This may be annoying for some, but it forces you to improve your decisions and trust yourself and your skills.